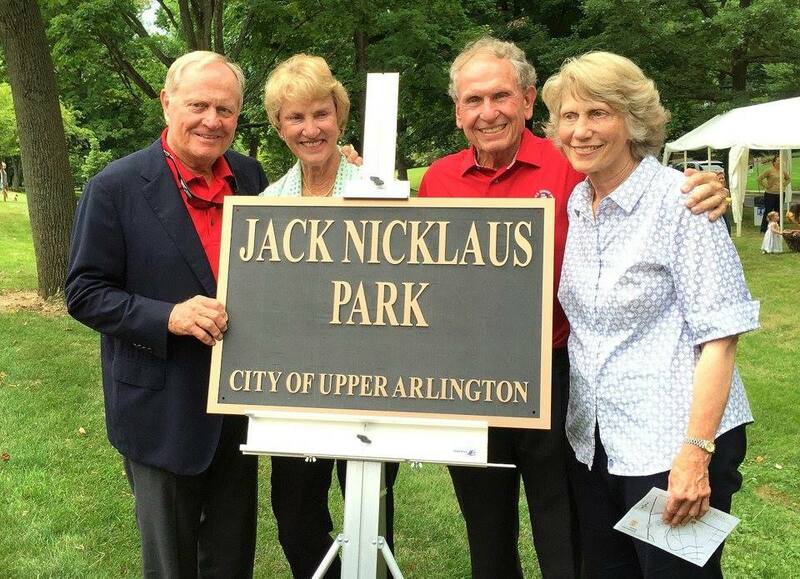 To recognize and celebrate one of Upper Arlington’s favorite sons, internationally renowned golfer Jack Nicklaus, Parkway Park was renamed “Jack Nicklaus Park” at a special ceremony on Wednesday, August 10. Jack lived next to Parkway Park for most of his childhood, up until his graduation from Upper Arlington High School in 1957. The park periodically served as his practice location and was directly en route between his home and the Scioto Country Club where Jack honed his game. The ceremony was led by City Council President Debbie Johnson, with a list of speakers including Council Member David DeCapua, Jack’s cousin Jim Nicklaus and the honoree himself. The park renaming has been championed by a committee of residents, family members and high school friends of Mr. Nicklaus, and is the first step in the group’s plans to develop a privately funded tribute to Jack at the park. While these plans are still in development, they will likely include a statue, plaque or stone wall, and enhanced landscaping.